We’re celebrating St. Patrick’s Day a wee bit early at my house… I’ll take tomatoes and peppers over corned beef and green beer any day… and it looks like we’ll have plenty of those! 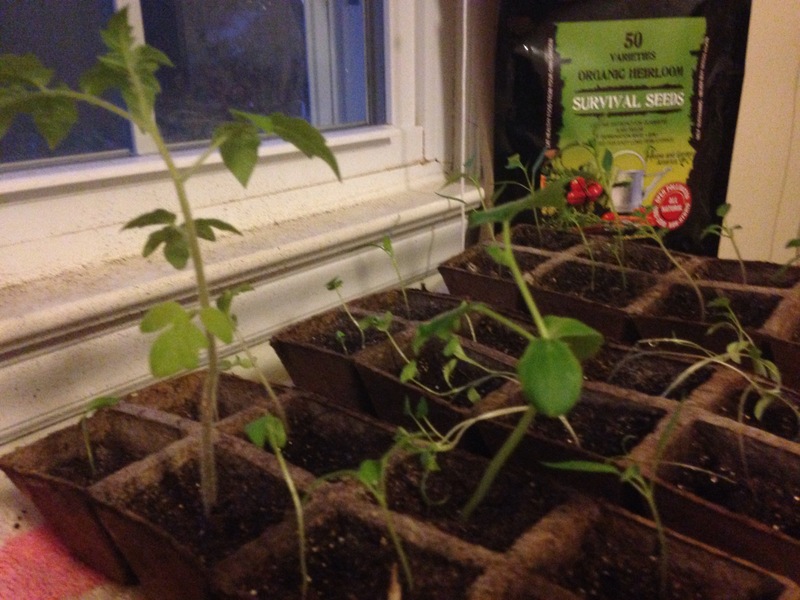 The tomato seedlings include beefsteak, floradade and red cherry. 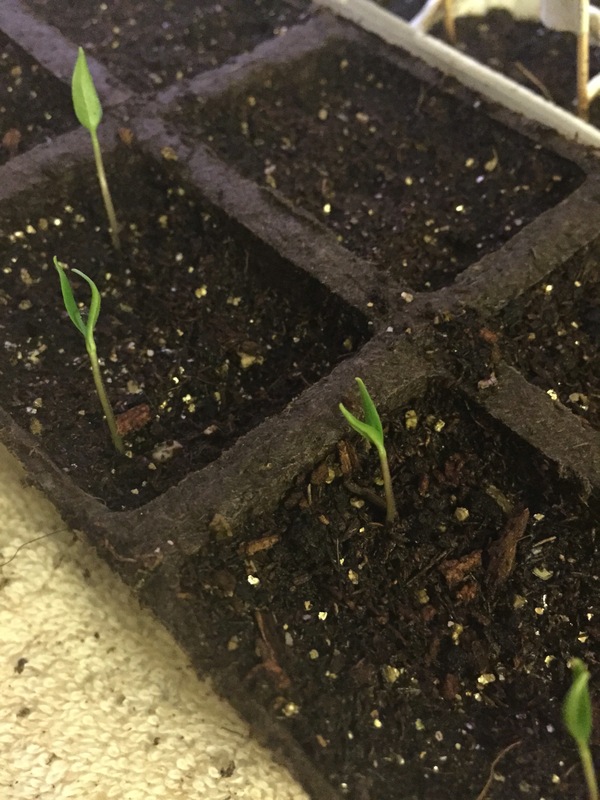 I also have several jalapeno plants. Still germinating are sweet peppers and serrano hot peppers. I have two bags of the serrano peppers in my freezer from two years ago, but it’s time to stock back up! 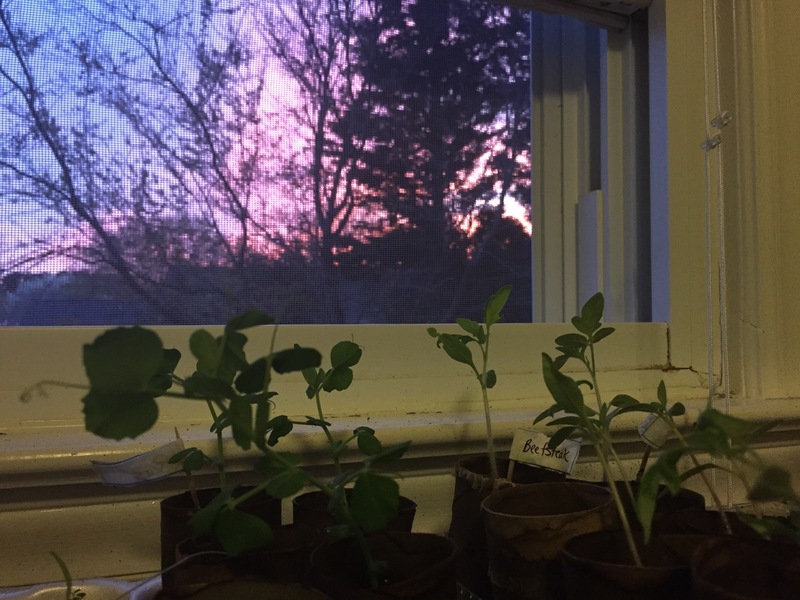 I decided to try starting peas indoors this year since I haven’t had luck direct sowing in spring or fall. 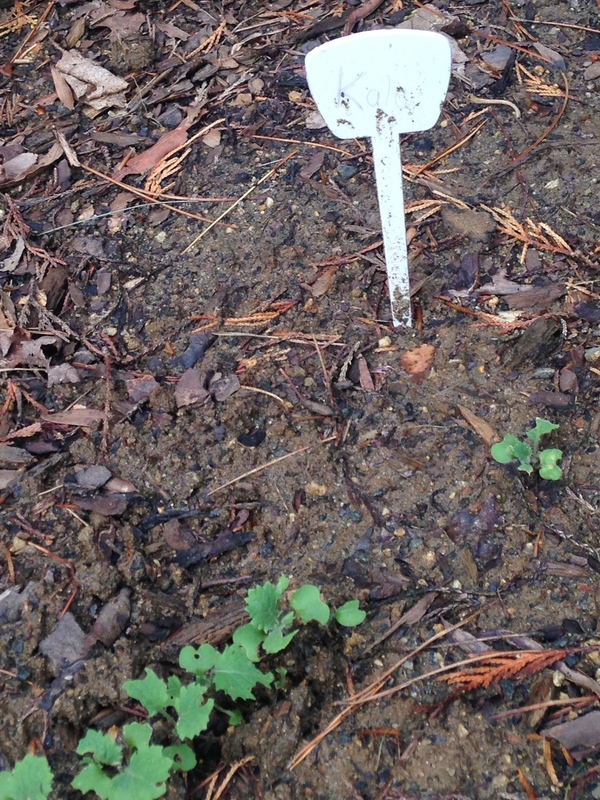 So far so good… I’ll give them another couple of weeks and then move to the garden. I also have two eggplant, two squash and one broccoli. 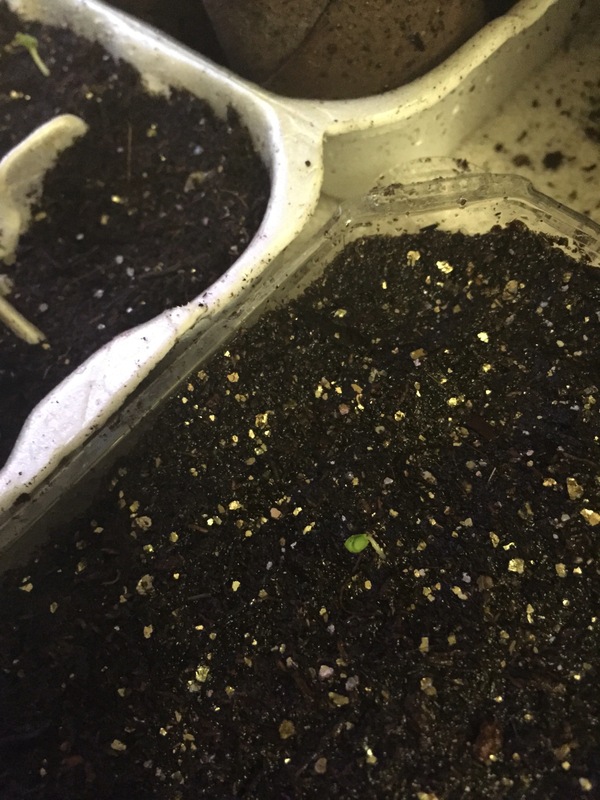 I planted a few more broccoli seeds since only one came up. My trusty sidekick asked to try corn this year. 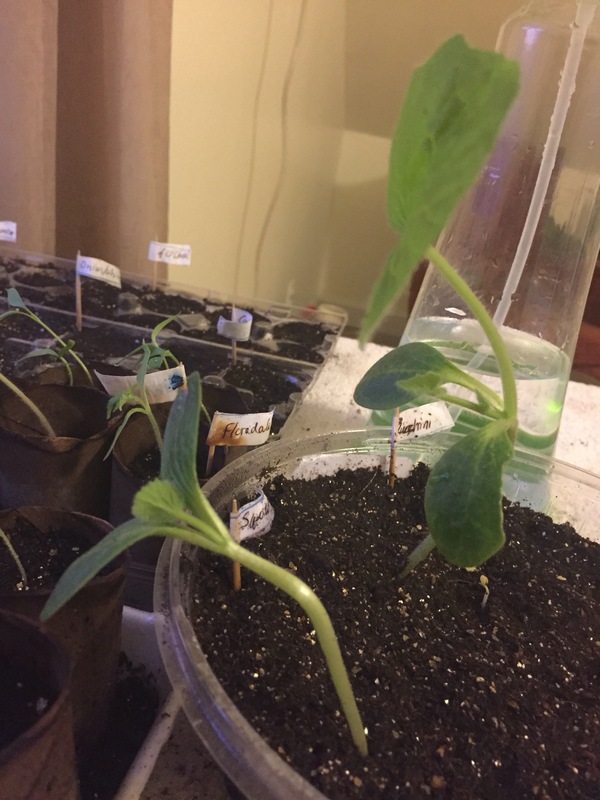 I did some research and decided to try the “three sisters” method once I can start direct sowing. This is apparently a Native American practice that involves training beans up the corn stalks and planting squash as ground cover. The plants feed each other important nutrients. 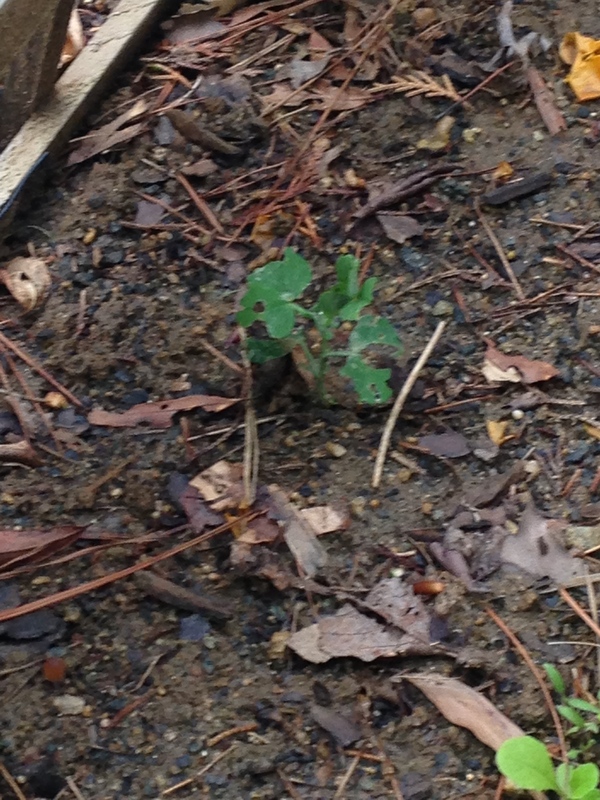 Another bonus… it will free up space on the trellis for what I hope will be a bountiful pea crop! I spent time this evening researching appropriate companion plants for the varieties I plan to grow. 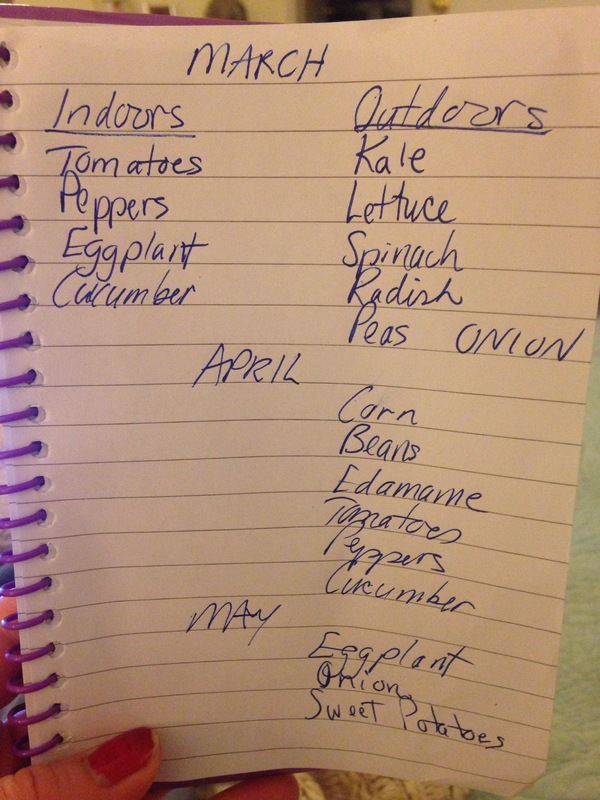 Also taking into consideration crop rotation, I developed the garden plan below…. Next week’s tasks include adding new soil and some compost to the garden so we can start sowing carrots, radishes, peas, spinach and kale! A year ago I found myself in the midst one of the busiest and more stressful seasons of my professional career, while also fighting a horrible virus that took its toll over eight months. Needless to say, my blog, and the garden to large extent, fell by the wayside. But what a difference a year makes. New job, clean bill of health… I’m back and ready to get my hands dirty! Our 2015 season wasn’t a complete loss. 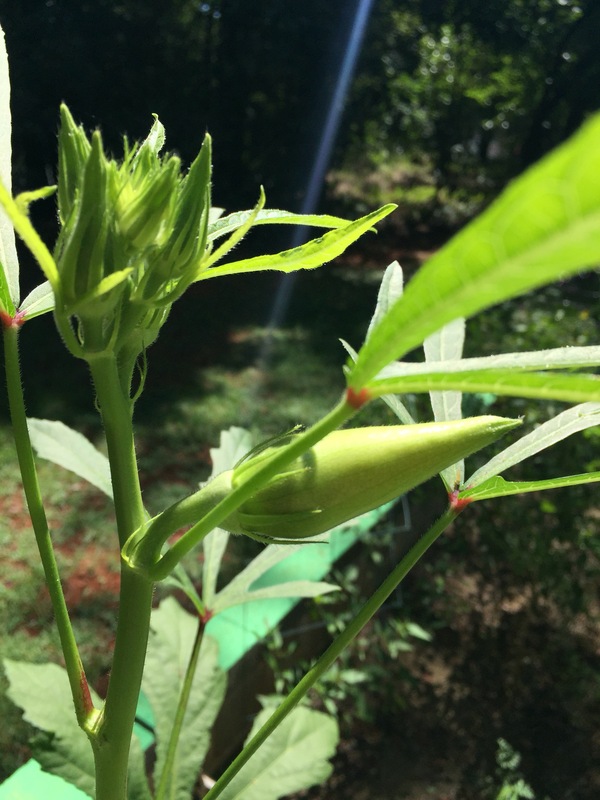 Okra was a pleasant surprise! We struggled with tomatoes and peppers (in large part due to the aforementioned disappearing plants), and I didn’t realize our edamame seeds were past their life expectancy so we came up empty there. I also failed again with peas (what is the trick?!?!). Now focus turns to 2016. This weekend I did a full assessment of our seeds, tossing the old and planning for the new. In the next few days we’ll start getting seeds in the dirt and back in their place of honor in the guest room. Husband: Uh, I have some bad news. Husband: It’s about your vegetable plants for the garden. I took them outside to get some sun and… well… they disappeared. Me: They disappeared? What do you mean they disappeared?!?! Husband: I don’t know. I put them down in the sun, and when I came back they were gone! Squirrels, wind, birds… who knows. We’ll file this one under unsolved mysteries. My husband felt terrible. He did manage to save a few plants that were strewn across the driveway. We re-potted those and planted new seeds that are now going strong. My perfectly organized and labeled collection of seeds became a hodge-podge of who knows what. 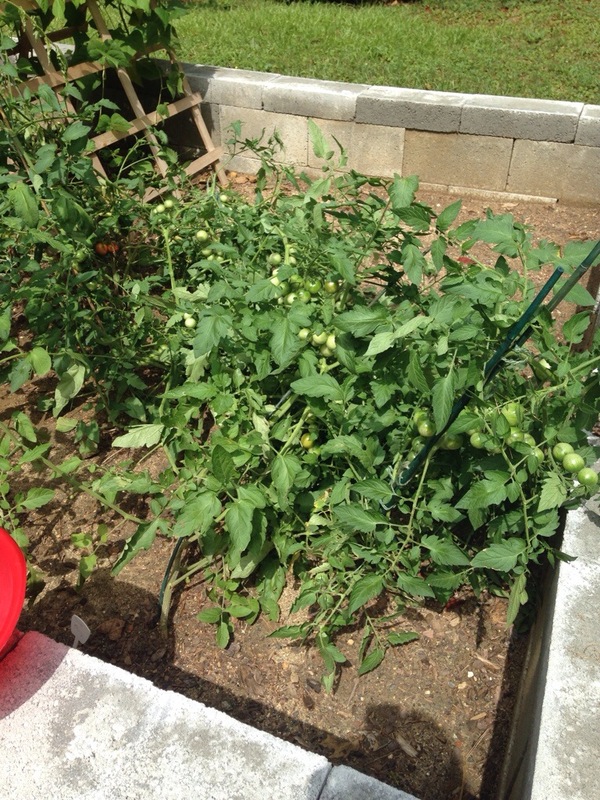 I can tell which plants are peppers and which are tomatoes, but beyond that, no clue. This weekend’s project will be moving the plants to the garden to join the radishes, carrots and salad greens. 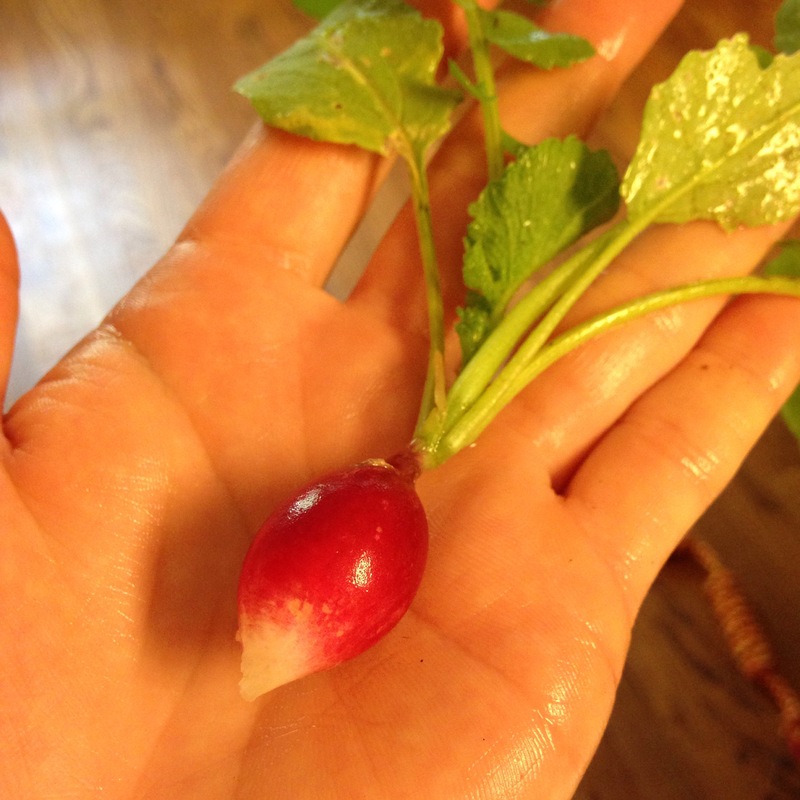 I even picked our first radish! On a Saturday morning in March my alarm went off at 7:15 a.m. I actually woke up at 8:15, which left exactly one hour to wake everyone else up, throw together swimming and ballet gear, and rush out the door to make my daughter’s 9:45 swimming class. 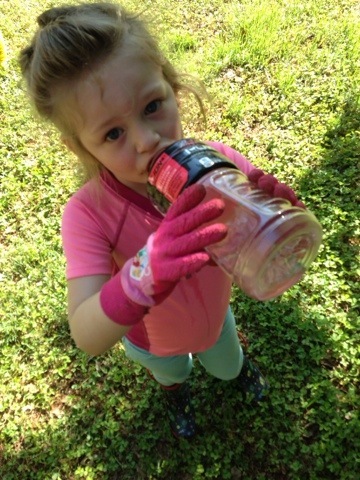 While she and I headed to swimming, my husband went the opposite direction to pick up dry cleaning and shop for a birthday gift for a 2:00 party, before meeting us at the YMCA at 11:00 for what was supposed to be parent observation day in ballet class… only to find out observation day was being pushed back a week. So I headed home, wrapped the present and suddenly had more than an hour of free time I wasn’t expecting. While the couch was calling my name, I instead changed clothes, grabbed some seeds and headed to the garden. And this, folks, is how our spring garden came into existence. In the time allotted I managed to plant two varieties of radishes, two varieties of carrots, kale, spinach, lettuce, onions and peas. About one month in, still no sign of the onions, but plenty of radishes (although they’ve grown more since this picture was taken). 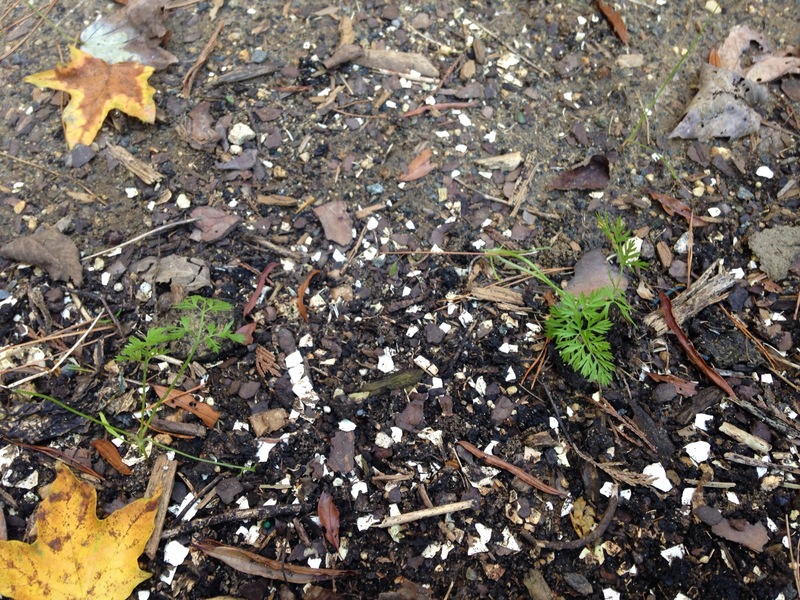 There are a few carrot tops and pea plants coming up, but they haven’t taken off yet. 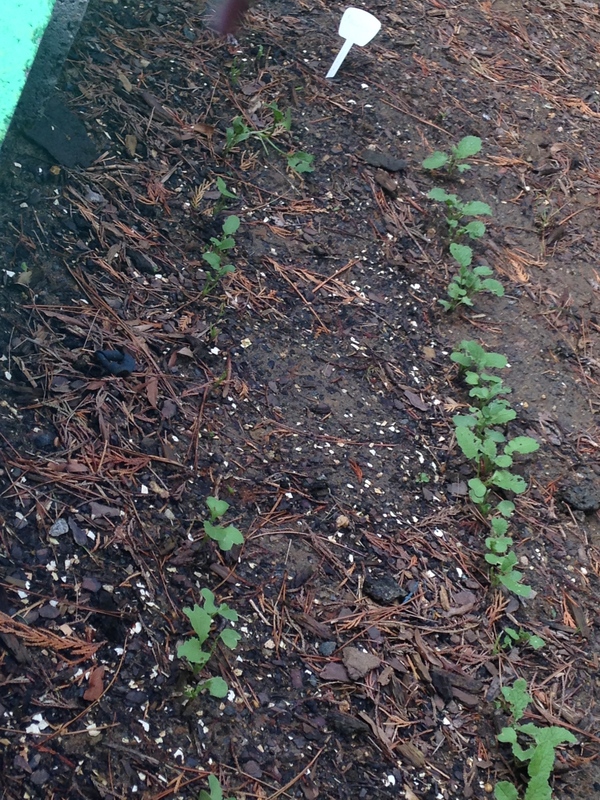 The lettuce, spinach and kale are showing promise. I see many green smoothies in our future. 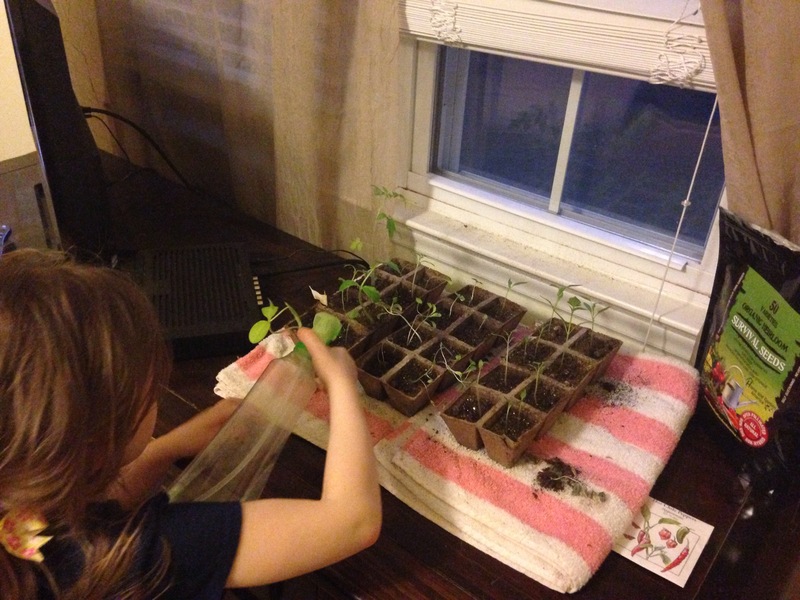 We also started seeds indoors… twice. More on that later. The good news is we seem to be headed toward another successful season in the vegetable garden. And we were only 10 minutes late to the birthday party. With freshly fallen snow melting away, I find my thoughts wandering often to the season of warmth. This winter was COLD (by southern standards at least), even dipping into the single digits! On the eve of March, daffodils are coming up strong and there are ample mud puddles – sure signs of spring. Hopefully she comes in like a lamb. Anticipation is building as we prepare to sow our second garden. With one year under our belts, we’re starting out a bit wiser and with the advantage of having our garden built and ready for planting. 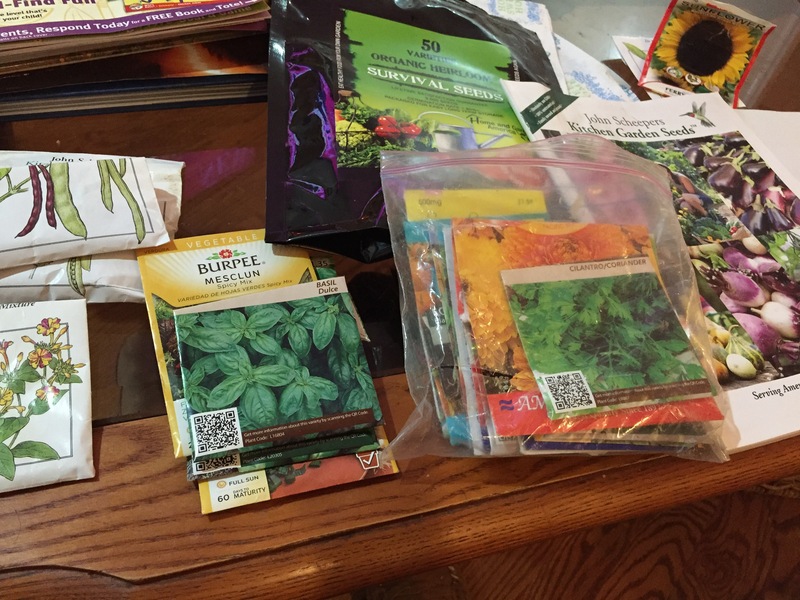 But we also have a new challenge – experimenting with heirloom seeds. 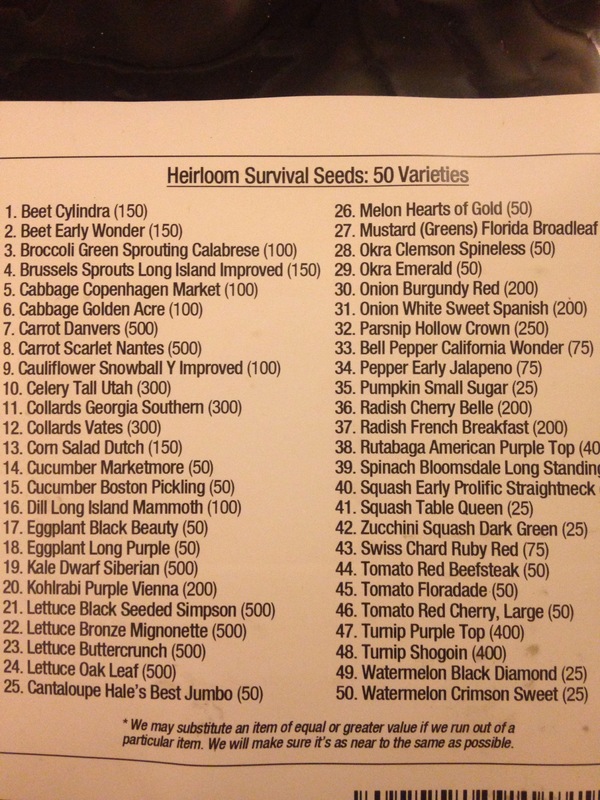 Thanks to a wonderful Christmas gift from my mom, we have 50 varieties of organic heirloom seeds that, theoretically, will continue to produce for years to come. 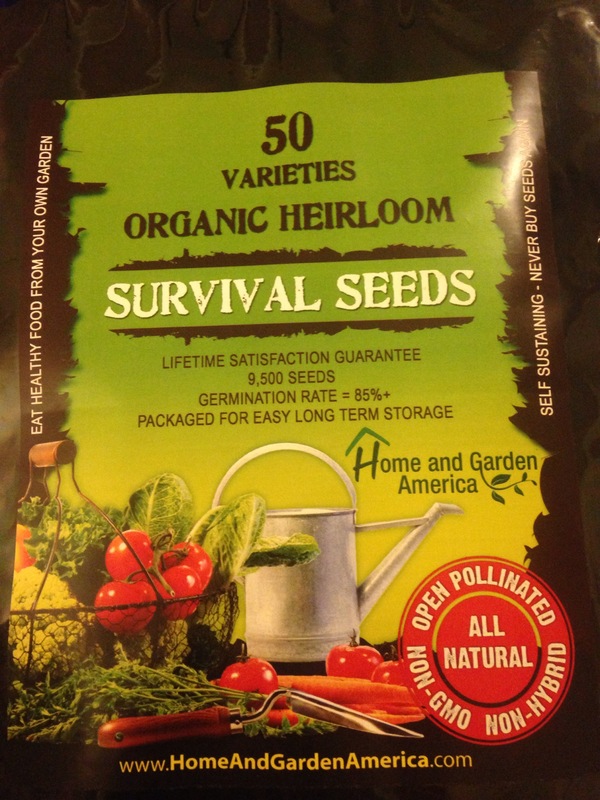 This will be a new adventure as I have absolutely no experience with heirloom seeds, but I’m intrigued. 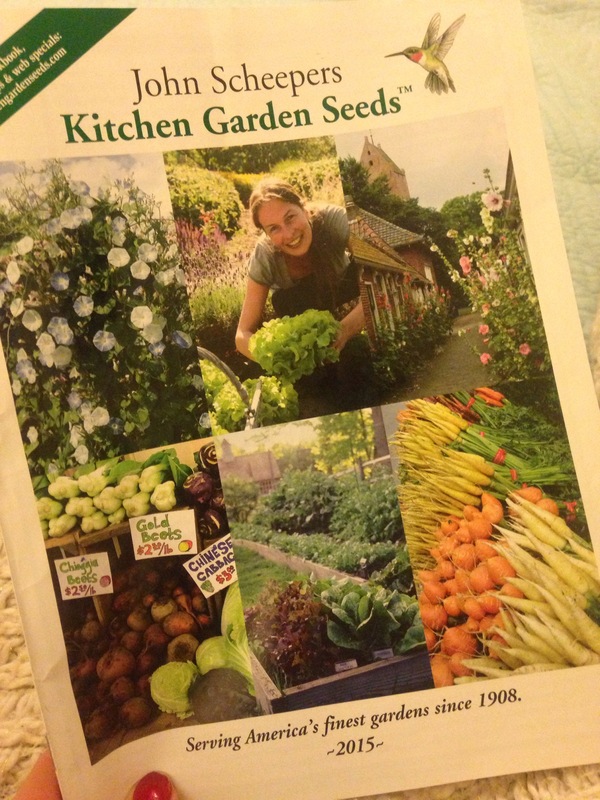 I also have several packets of the John Scheepers Kitchen Garden Seeds we ordered last year that will be a nice compliment to the heirloom seeds. 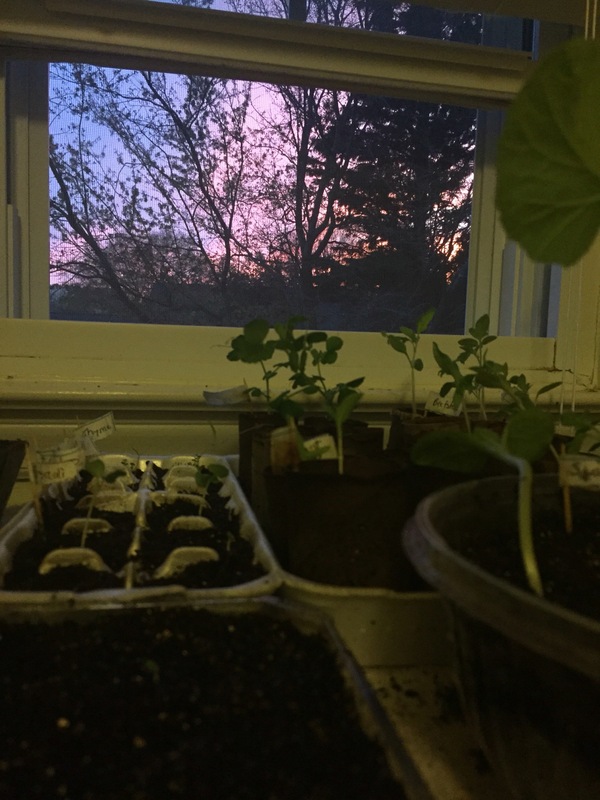 In reality, I’m a couple of weeks behind getting the seeds started indoors, but considering last year we were scrambling to cover the plants to protect them from frost, being a bit later transplanting won’t be a deal breaker. I spent the evening plotting out what we need to start growing indoors and when items will need to be moved or direct sown in the garden. I found a helpful tool to assist with this process on The Old Farmer’s Almanac website. 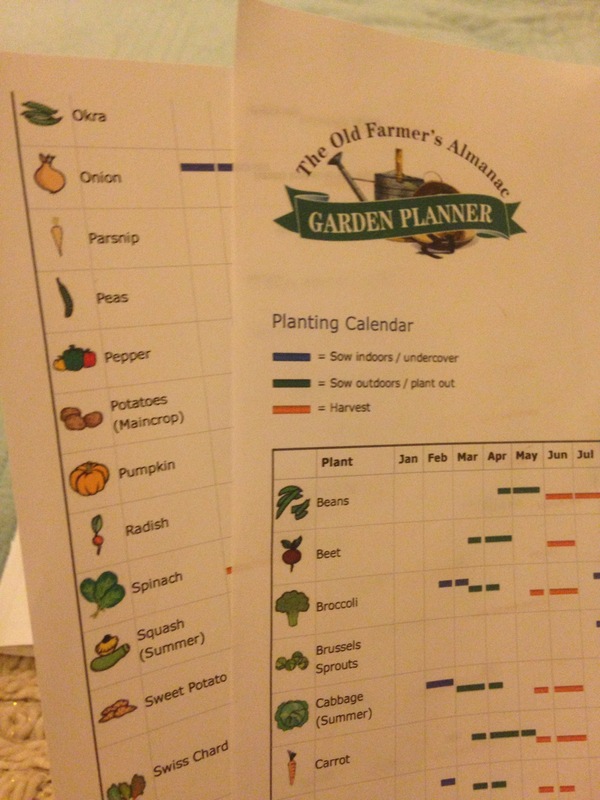 By entering my zip code, it gave me a personalized planting and harvesting chart for various vegetables. This weekend we’ll need to tackle planting the tomato, pepper, eggplant and cucumber seeds, as we look forward to a time to reap. Now that we’ve officially rung in 2015 (which in my case consisted of dozing on the couch, living vicariously through Ryan Seacrest), talk at our house has turned to planning our next garden. And of course it’s the perfect time to reflect on our first attempt – what worked and what went wrong (in some cases, terribly wrong). So here you go: my top five wins, losses and lessons learned. 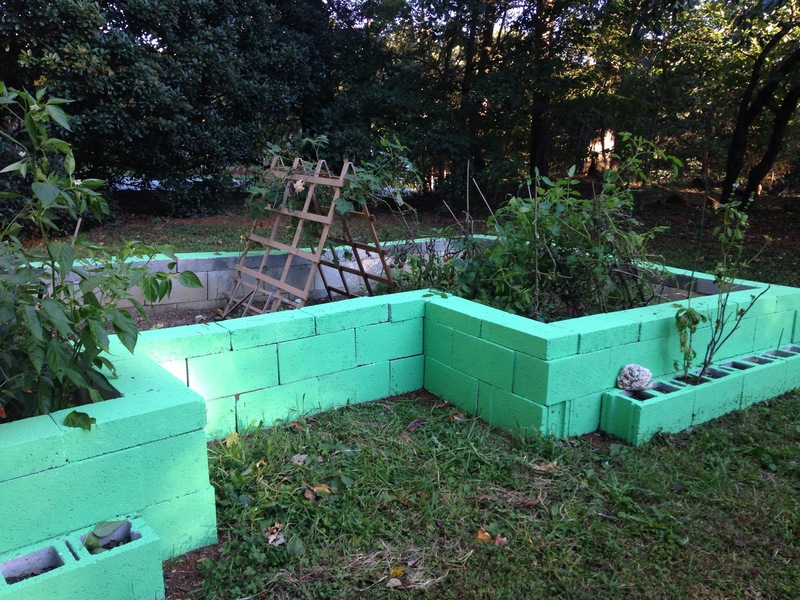 Garden Structure: It was exhausting, pain-staking work, but I’m so happy with the final result. By building up the walls we kept critters out. The soil, a special garden blend, produced strong plants. And the coat of green paint was the perfect finishing touch. Sun: We were effective in maximizing the limited amount of sun in our backyard. It took patience in plotting out where the sun was hitting at various times of day before building the garden… we used every possible inch. Tomatoes, Peppers and Beans: We grew A LOT of them! The final yield of peppers was lost in first hard frost… in mid-November. I was surprised by how well they stood up to the chilly fall nights and the overall amount produced, especially from the beans. 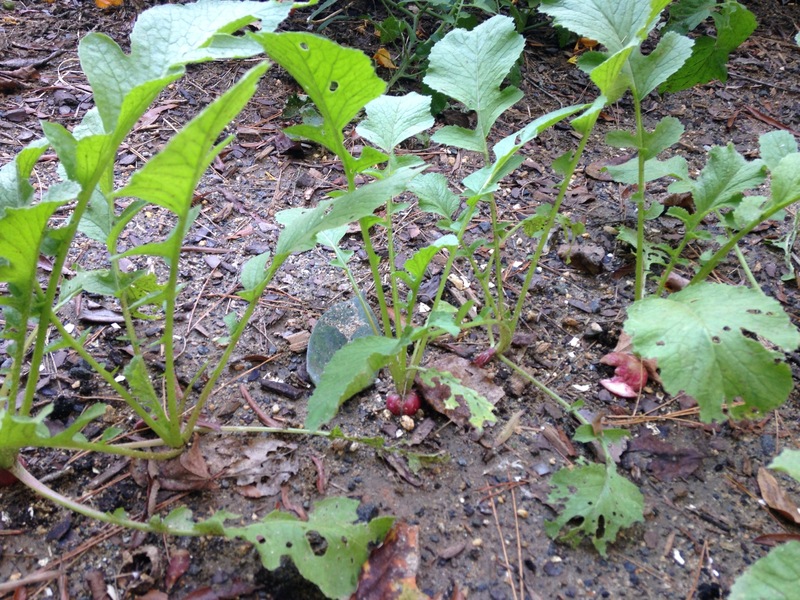 Radishes: I will definitely include radishes in our spring garden. The plants took off quickly in the fall and produced the best radishes I’ve ever put in my mouth – tender, delicate and just the right amount of bite. No one else in my house liked them. That’s fine – more for me. 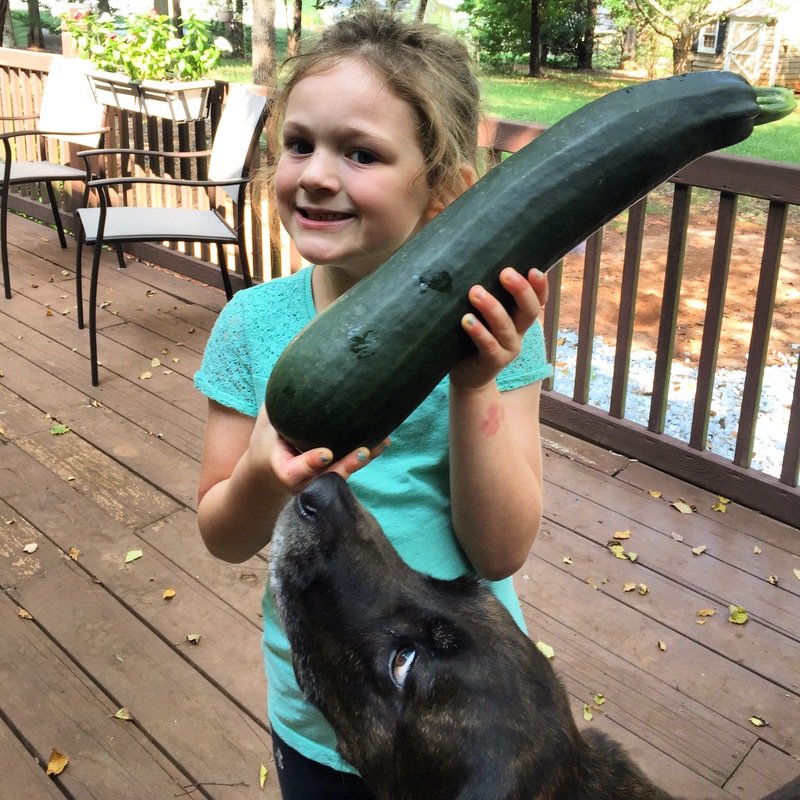 Learning: My heart skips a beat when my daughter starts talking about the garden. I’m amazed at how much she learned and her genuine joy in “working in the garden”. Of course, her experience with gardening may mimic my experience with fishing – I thought it was cool in preschool, but later wised up (love to eat it – won’t catch it). That said, she is very aware of where her food comes from and is eating (and enjoying!) vegetables. Win, win! Support Structures: This was by far my worst mistake. The bamboo stakes I used to support the tomatoes and peppers were not nearly strong enough. The tomatoes collapsed a number of times. I had to constantly replace the stakes, reinforce by adding more, and move the vines to redistribute the weight. Coming this year, proper cages. 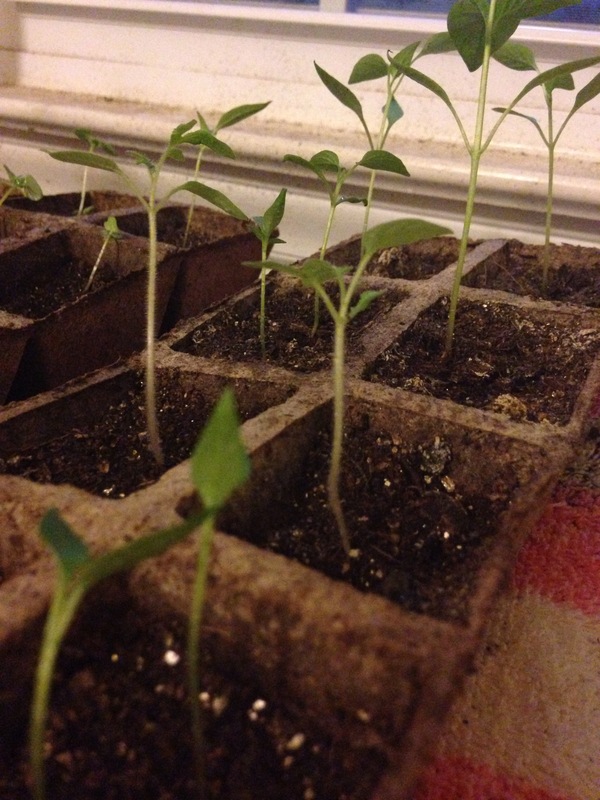 Variety: I planted a total of five tomato plants and four chili pepper plants, but only two varieties of each. I wound up with too many cherry tomatoes and serrano chilis. I was able to stock my freezer with chilis, but having more of a variety would be a plus. 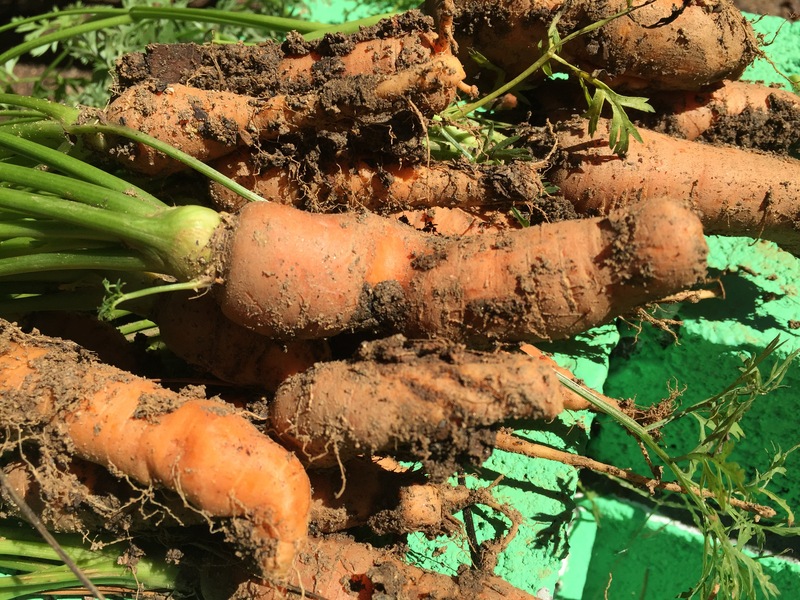 Carrots, Peas and Eggplant: I failed miserably with all of these – even after attempting the peas and carrotts in both the spring and fall. Each time I ended up with one teeny tiny carrot and no peas. I did have the beginning of a nice pea plant in the fall, but it froze before having a chance to do anything. 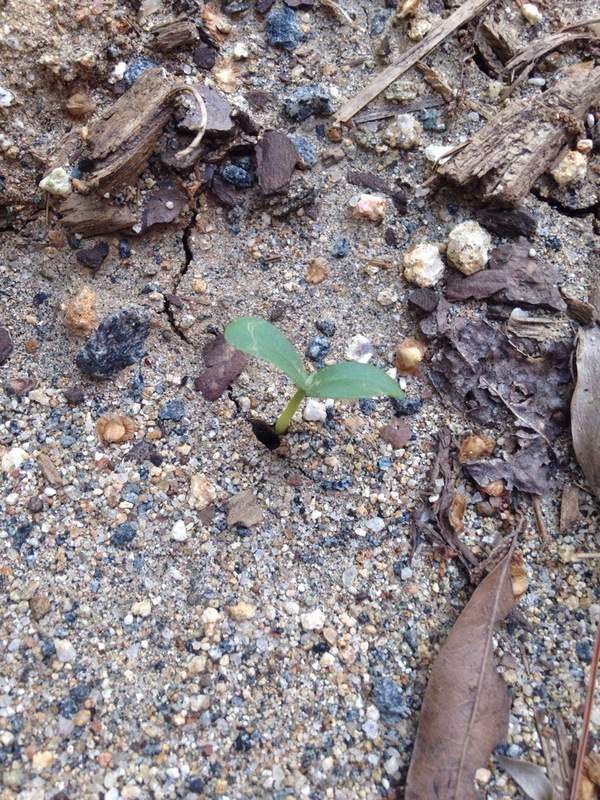 At one point I thought I had an eggplant… it was a weed. Not my proudest moment. Strawberries and Edamame: We did not eat a single strawberry. The few that we saw were tiny and rotting. I think the birds may have enjoyed the ones that were decent for eating. I won’t be attempting strawberries again. The edamame are a win in the sense that we enjoyed what we grew, but I underestimated the amount each plant would produce. The plants are small and low to the ground with limited pods. This spring I plan to use the space occupied by the strawberries to plant more edamame. Herbs: I also came up short in the herb department. The basil took off and was strong all season, but only because that was a transplant from the garden store. 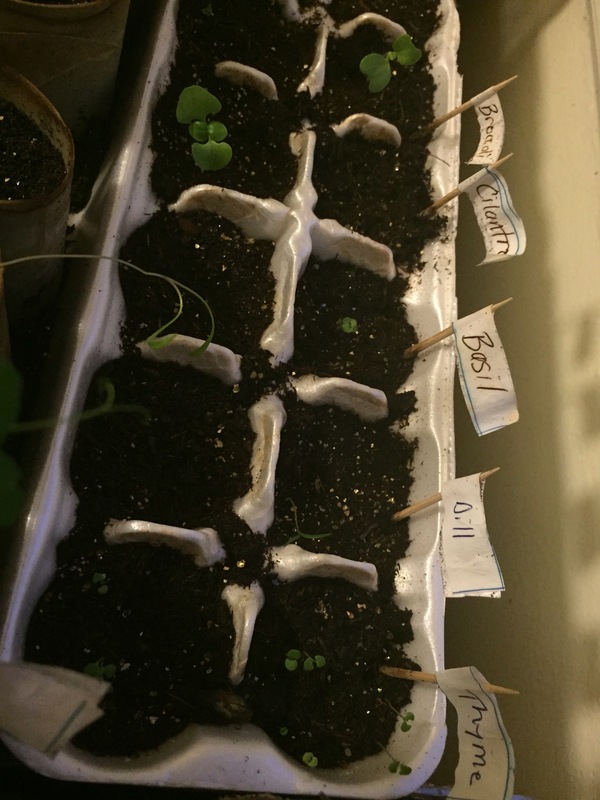 The herbs I tried to start from seed (cilantro, oregano and thyme) did absolutely nothing. And there you have it. Cheers to 2015!